To address gaps between care needed and provided, and the panoply of emotional concerns compounding worsening dyspnea, the INSPIRED COPD Outreach Program™ was implemented in Nova Scotia (NS) in 2010/2011 as an evidence-and community-based holistic innovation. Enrollment criteria were: confirmed or pending diagnosis of COPD (spirometry), community dwelling in Halifax Regional Municipality, willingness to be enrolled and at least one criterion that defines advanced disease and increased mortality risk [from Medical Research Council (MRC) 4 or 5 dyspnea, at least one admission in 12 months prior to index admission, an ICU/IMCU admission in previous 12 months, chronic respiratory failure (PaCO2 > 45), or clinical signs of right heart failure]. Patients are followed post-discharge at home, through two visits by a Certified Respiratory Educator (CRE) providing self-management support/education (supplemented by an adaption of the American Lung Association Living Well With Chronic Lung Disease program), liaison with/referral to allied health, and individualized Action Plans for both acute exacerbations and dyspnea crises. If the latter occur despite background use of conventional low-dose immediate and/or sustained-release morphine or equivalent for refractory dyspnea, we take a stepwise approach similar to that recommended by the American Thoracic Society. Following the educational visits, a Spiritual Care Practitioner (SCP) then provides psychosocial/spiritual support and advance care planning (ACP) to complete personal directives. A ‘daytime support-line’ is also available. INSPIRED, (over 500 enrolled to date) has impacted key indicators (e.g., ~60% reductions in hospital length of stay, readmissions), while improving patient and family experience with substantial cost aversion. Patients felt more confident managing their symptoms and willing to discuss goals of and end-of-life care. For patients dying after involvement in the program (n=84), we were able to support requested home deaths for 32 of the decedants (38%) and for those admitted to an acute or palliative care bed (there is no hospice in Halifax), final admission length of stay was significantly shorter and ICU or IMCU usage less than for COPD-related deaths outside of our program. Between 2014-2015, a pan-Canadian quality improvement collaborative (QIC) was delivered by the Canadian Foundation for Healthcare Improvement (CFHI), with arms-length funding and support from Boehringer Ingleheim Canada Ltd. The QIC supported 19 teams in 10 provinces to adopt, adapt, implement and evaluate an INSPIRED-like innovation in their own jurisdictions. Evaluation followed a mixed-methods summative approach relying on team documents, key informant interviews, focus groups and surveys. During a 1-year period of instruction, CFHI offered 24 webinars (~46 hours of instruction), two in-person workshops, four regional roundtables, and numerous teleconferences within and across teams. Collaborative teams completed pre-and post-webinar surveys. Patients consistently reported greater self-confidence in symptom management and in the transition from hospital-to-home, return to daily activities and enhanced functional status (see below for two illustrative examples). Bridge the “silos of care” (e.g., hospitals working with community care and facilitating a more seamless hospital-to-home transition). Of 19 collaborative teams, 18 enrolled patients in INSPIRED-like programs with 1011 patients enrolled as of 8 months post-collaborative. Fifteen teams have indicated ongoing enrollment. Teams reported early and consistent reductions in hospital usage with early reductions as high as 80% in the three-month pre-post period. Fifteen teams incorporated the core INSPIRED interventions while 13 (68%) incorporated additional interventions, e.g., smoking cessation, pulmonary rehabilitation, and improving inter-professional collaboration for patients with complex needs. Most models of care were acute-dominant, consisting of pulmonary specialist outreach, as opposed to community dominant (e.g., home or community-based programming). 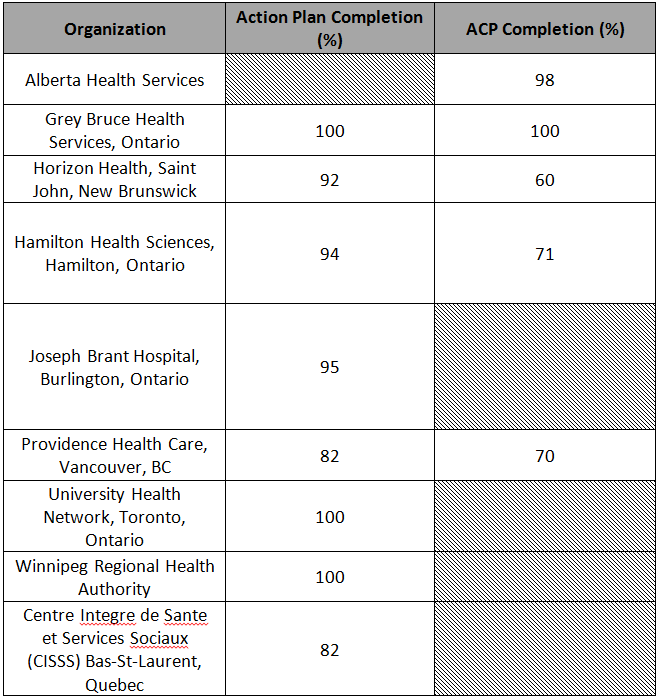 Table 1 indicates examples of team action plan and advance care planning completion rates immediately post-collaborative. Dominant barriers to sustaining the INSPIRED QIC included a lack of continuous resourcing, competing demands on staff time, and difficulties associated with providing comprehensive care for patients with complex needs. A 2016 independent return on investment analysis showed that if INSPIRED reached fewer than 1% of people living with COPD in Canada, it would result in 68,500 fewer ED visits; 44,100 fewer hospitalizations; and 400,000 fewer bed days in the next five years, translating to reduced costs of $79 million in ED costs, and $644 million in hospital costs (or, for every dollar spent, $21 would be saved in reduced hospital costs). Beds no longer required for patients with COPD speeds access to appropriate care for others. The INSPIRED COPD Outreach Program™ and its adaption within a pan-Canadian spread collaborative proved feasible, effective and created efficiencies. As in Nova Scotia, patients reported several benefits to participation. Multidisciplinary teams were able to implement, evaluate and indicate pointers to success and longer-term barriers. Economic projections indicate that adopting INSPIRED would yield sizeable cost-aversion. Health systems willing to adapt can support patients with high needs. In the absence of effective COPD organizational infrastructure using similar clinical innovation, patients with advanced COPD will continue to rely on EDs in the absence of alternatives. Addressing their unmet needs through an INSPIRED approach to COPD care can reverse this trend and result in better care, health and value for money. Examples of INSPIRED collaborative team action plan and advance care planning completion rates immediately post-collaborative.